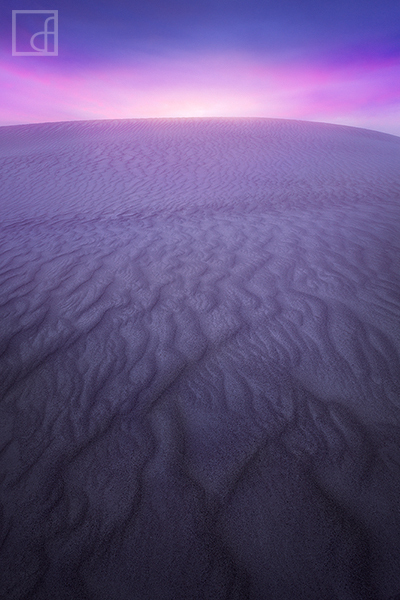 The stunning sand dunes of Western Australia photographed at dusk. There was no harsh light on this particular evening which is often desired when photographing sand dunes to enhance the ripples in the sand, so I searched for something different. This view looks up a dunes straight into the glowing clouds above. The contrast in the ripples is actually from the ridges being formed by much darker grains of sand. Not sure how this occurs but it worked very well under these soft lighting conditions and made for a glowing scene. Secure your limited edition, Lancelin Sand Dunes photographic print, 'Ripple Effect', by selecting your desired print size in the menu to the right.